At the beginning of the twenty-first century, key public health issues and challenges have taken centre stage. They range from arsenic in drinking water to asthma among children and adults; from the re-emergence of cholera, to increasing cancer rates and other chronic diseases; from AIDS to malaria and hepatitis; from the crises faced by displaced or refugee populations to the new challenges that have emerged for reproductive health and rights. Like most aspects of contemporary life, these problems have been impacted by globalization. The issues that confront us are being shaped by evolving processes such as the growth of inequalities between the rich and the poor in countries around the world, the globalization of trade and commerce, new patterns of travel and migration, as well as a reduction in resources for the development and sustainability of public health infrastructures. 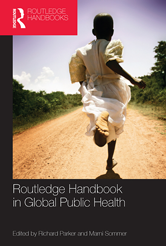 The Routledge Handbook of Global Public Health explores this context and addresses both the emerging issues and conceptualizations of the notion of global health, along with expanding upon and highlighting the critical priorities in this rapidly evolving field. It is organized in ten main sections.